Hucker, Jacqueline. "Rideau Hall". The Canadian Encyclopedia, 04 March 2015, Historica Canada. 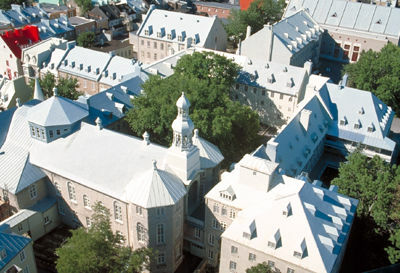 https://www.thecanadianencyclopedia.ca/en/article/rideau-hall. Accessed 23 April 2019. A sophisticated estate that incorporated the primary elements of English landscape style, Rideau Hall was thought to be in keeping with the stature and lifestyle of the Queen's representative in Canada. Rideau Hall, Ottawa, is the official residence of the Governor General. 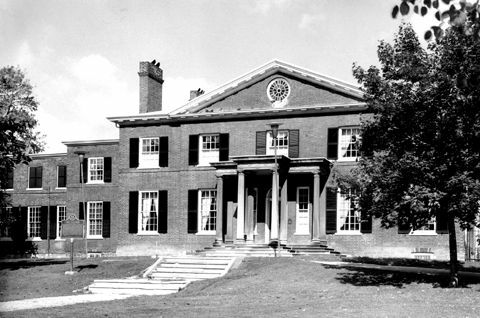 The estate was created in 1838 by Thomas McKay (1792-1855), industrialist and lumberman, who upon his death left a property of 1000 acres in what is now the greater Ottawa area. In 1864 the Government of Canada leased McKay's villa and 79 acres as a temporary residence for Lord MONCK, the Governor General. Three years later the government purchased the property, but it was not until 1913, after several renovations and expansions, that Rideau Hall was made the Governor General's permanent residence. A sophisticated estate that incorporated the primary elements of English landscape style, Rideau Hall was thought to be in keeping with the stature and lifestyle of the Queen's representative in Canada. In accordance with the conventions of this style, the estate's centrepiece was an elegant villa set on a rise of land where it commanded expansive views across formal gardens, lawns and the estate farm. In 1864 the government carried out major renovations to Rideau Hall, which reinforced its character as a transplanted British country estate while enhancing its picturesque character. To accommodate the Governor General, his family and staff, a long 2 storey wing was added which ran along the edge of the formal gardens, emphasizing a division of the property into a service precinct to the north with flower gardens and parkland to the south. The principal driveway was reconfigured along present lines, a number of service buildings were introduced, and an octagonal brick gate lodge and beautifully worked wrought-iron gates were erected at the entrance. A belt of trees was planted along the boundaries of the estate, a cricket ground was laid out on one section of the lawn and 2 miles of footpath were cut around the property. Until after World War II most changes to Rideau Hall upheld the precepts of British landscape styles. The ball room and tent room were added in the 1870s to accommodate grand public events. In the 1880s and 1890s the cricket pavilion, outdoor rink and toboggan run were added, along with a second wing to the main house. 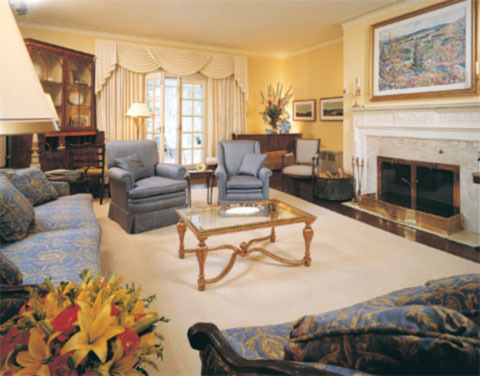 When the government finally decided to make Rideau Hall the permanent official residence, renovations consistent with that commitment were undertaken. In 1913 the residence received its monumental pedimented entrance with its Royal Coat of Arms. This addition has become a landmark feature, reinforcing the residence's role as the seat of the Crown's representative. Shortly after the 1913 renovation was complete, the Duke of Connaught, during his tenure as Governor General, made a significant change to the landscape. He took down many conifers, whose appearance he found gloomy, replacing them with more than 600 maples, elms, oak, ash and spruce. This project was complemented by the development of the adjacent Rockcliffe Park as a public area of attractive green space. The character of Rideau Hall, as we know it today, was essentially established with a large-scale improvement begun in 1927 when the stone and iron fence was erected around the boundary. Since the appointment of Vincent MASSEY in 1952, the Governor General has come to play a significant role in recognizing and celebrating excellence in Canadian society. Correspondingly, Rideau Hall has evolved from a private to an increasingly public property. Since 1934, the Federal District Commission (now the National Capital Commission) has managed the grounds. It removed remnants of the estate farm and large vegetable garden but continues to enrich the property's extensive and varied plant material and to maintain the coherence of its landscape plan. Les Amis de Rideau Hall, Rideau Hall, Témoin vivant de notre histoire (1994); R. H. Hubbard, Rideau Hall: An Illustrated History of Government House (1967).